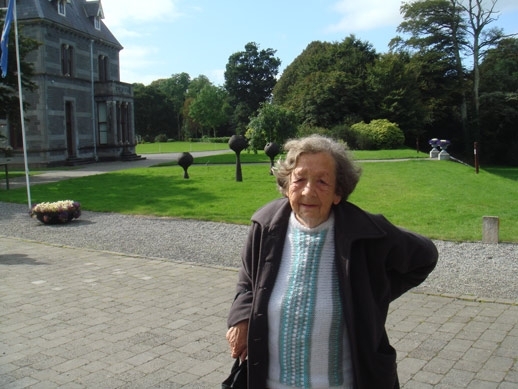 Our dear friend Christine O'Mahoney died peacefully in her sleep, in hospital on Monday evening, after a short illness. Born in in Dunleary in 1922, Christine moved to Nottingham as a child, to live with her Aunt. She married in Liverpool before the Second World War, loosing her husband in the conflict. She spent her war years running a pub in the docklands area of Liverpool. She eventually came to London, to work with her Mother at the London Hospital on Whitechapel. She has been associated with the Simon Community for many years, both as resident and worker. The picture shows Christine on a trip to County Mayo last year. She returned most years as a guest of the Mayo Emigrant Liason Committee. Those who know St. Joseph's well, will know Christine as 'part of the furniture' she was usually found sitting at the front door welcoming visitors. She always said that St Joseph's was her second home. She will be greatly missed by all. God bless. Rest in peace. A very strong spirited woman - wherever she is now, may she be at peace. Sorry to hear this news. I have fond memories of meeting Christine during my time living in community. She always made me laugh especially at meetings. Christine was always ready to tell you about the history of community,of the life she'd lived and the characters she'd met. I know community members present will have given her a good send off. Rest in Peace Christine.